So far the brute had found that out of all the groups he could've chosen, he had joined the most despised of all. Had he had known this prior to joining he would've head elsewhere. In retrospect he should've done a lot of things he had thought to be pointless. But oh well, he was a Pittian now. Although it slightly bothered him that others would dislike him simply because of his clan, he would never just leave without a solid reason. So he sort of compensated, unless needed Kydobi would nap or wander. Today he was practicing the latter. However the weather here was much different than the warm climates of the jungle and desert. There was a chill and while he knew it couldn't be cold as the snow capped peaks, it was enough to make the equator inhabitant shiver. So he kept to the sea side. Being careful to not trespass and waited patiently at the borders. he wouldn't have to wait long before someone showed up at the border, her face blank. 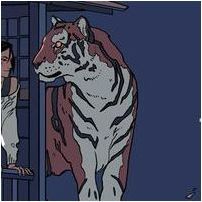 the tigress that had come at a gallop in answer to the rotten stench of the pitt, stood tall and study, ice-cold optics locked onto the ebony furred male in front of her. she wasn't anyone special, but she was known at one time for her blood thirstiness. growling lowly, she approached him with a warning in her step, "looks like you got the inch of the yardstick, pal. you're on the border of elysium, and we don't take all that kindly to pittians in places they do not fit in." perhaps she was a little aggressive but she had many violent memories. Luck perhaps would have been on the jaguar's side had the petite sand cat approached before Kade. Tena had yet learned to recognize the smell of the Pitt, although she knew their reputation. Depurs. Monsters. As such, the little Demdji blinked slightly, her unusual blue eyes narrowing as the tigress' words registered. Only, the new Magna did not understand why a member of a group that considered everyone the enemy would be sitting patiently on the border. Suspicious. Almost. She sensed no malice in the air. Other than the anger in Kade whom she frowned lightly at. Didn't she realize how odd this was? Tena had known few Depurs to be patient; they were the sort to waltz in like they owned the place. Quietly, the feline trotted past, stepping over the border to address the jaguar. There was no friendly smile on her face today, but her sharp voice only held curiosity. A sandy tail did twitch, however, back and forth restlessly. "Why're you here?" A tiger. The largest female he had laid eyes on sped towards and and stopped only to deliver her growl and warnings. Kydobi sighed, it was beginning to get old now. How easily judged he was simply because of where he stayed. It bothered him, reminded him of his past. But he stayed calm. "Well I made sure to not cross your borders. So I don't believe you have too much to get angry over." Sighing Kydobi stood up, shifting his paws. He made sure to hold his head high and maintain eye contact with the tigress even if he had to tilt his head up, "I know you have your preconceptions of me, simply because I'm from the Pitt. But let me tell you they're misconceptions. I am Kydobi and it is a pleasure to meet you." He would remain polite, someday he would stand by Jervis. He would hope to advise him to make wiser decisions but none knew of his plans other than Bai Shi. Soon another feline would show up, but a much much smaller one. Kydobi dipped his head in respects, "I came to just meet the other groups. I've recently joined the Pitt, unfortunately I learned on their nature only after the fact. You'll find I'm not a savage brute. I understand how foolish some of their... ideologies are.". And I have plans to alter them. Cause change like the Rosebloods have experienced. But little did he know. His tail rippled, "I've been to the Typhoon, and the Rosebloods. Both accepted me with little to no issues. I simply came to talk and get to know you all."